Ten???? Hours and Counting Until the Wreath Making Dinner Party.. The sodas and water are iced. The ham and fruit and veggies are in the frig. The wreath bases are made. Riley Rover and I are looking forward to greeting you at Mosquito Gulch for our Annual Holiday Event at Mosquito Gulch. RSVP for directions! Remember clippers, sneakers, gloves, dish and some great ideas for your creation! Just a Few Hours and Counting Until the Wreath Making Dinner Party! 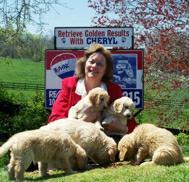 You'll Retrieve Golden Results with Cheryl Ritchie, RE/MAX Leading Edge, for all your Southern MD Real Estate Services. Visit www.GoldenResults.com. What are you taking to Thanksgiving Dinner? Do You Have Any Thanksgiving Customs? What new books are loaded on your Kindle App for the Holidays? What new music CD's are on your Holiday fun list? What movies are are your Holiday Fun list? Annual Wreath Making Dinner Party… Family, Friends, Clients, N'Hood! My First Wegmans Visit and one Vitamix Juicer Later!